Over the course of the last year, at World Economic Forum and elsewhere, I have asked participants two questions. First I ask for a show of hands on whether they feel confident about their current skills taking them through to the end of their careers – about one in five raise their hands. Then I ask if they feel confident about advising their children on their education to prepare for their own futures: none raises their hand. These are some of the most knowledgeable, leading figures in the world and yet they, like many of us, are uncertain about what the future of labour markets looks like. 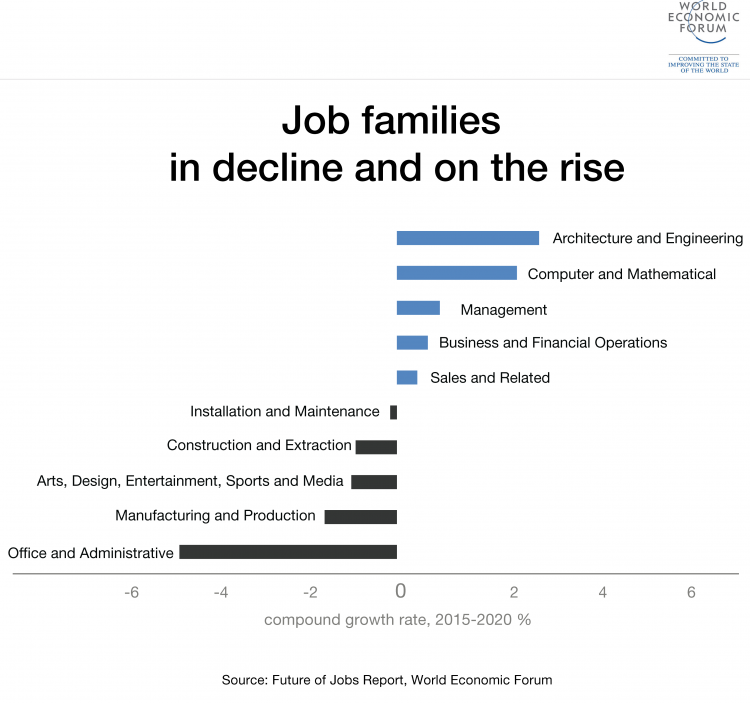 Globalization and technology are accelerating both job creation and destruction. Some estimates have put the risk of automation as high as half of current jobs, while others forecast a considerably lower value of 9%. Still, all occupations will go through change: we found that on average one-third of the skillsets required to perform today’s jobs will be wholly new by 2020. At the same time, education and training systems are not keeping pace with these shifts. Some studies suggest that 65% of children currently entering primary school will have jobs that do not yet exist and for which their education will fail to prepare them, exacerbating skills gaps and unemployment in the future. Even more urgent, underdeveloped adult training and skilling systems are unable to support learning for the currently active workforce of nearly 3 billion people. In addition, outdated cultural norms and institutional inertia already create roadblocks for half of the world’s talent – and are getting worse in the new context. Despite women’s leap forward in education, their participation in the paid workforce remains low; and progress is stalling, with current forecasts for economic parity at 170 years. The near-term outcomes of these dynamics, compounded through other demographic, geopolitical and economic factors, are profoundly challenging. They include skills gaps in the workforce that are difficult for employers and workers alike, unemployment and job displacement, particularly in blue-collar and services work, rising fear of further technological unemployment, insufficient supply of talent for many high-skill occupations, and loss of female talent and potential. Together these factors are exacerbating income inequality and creating a crisis of identity. Yet, most of these dire predictions need not be foregone conclusions. If leaders act now, using this moment of transformation as an impetus for tackling long-overdue reform, they have the ability not only to stem the flow of negative trends but to accelerate positive ones and create an environment in which over 7 billion people on the planet can live up to their full potential. Instead, in several advanced economies, we are seeing the political and social consequences of short-term, emotive – and sometimes disingenuous – thinking. For those who are losing out from the changes underway, fear is an understandable response. But turning away immigrants, trade or technology itself, and disengaging from the world, is a distraction, at best. At worst, will create even more negative consequences for those already losing out – and many more. It is up to courageous, responsible and responsive leaders and citizens to take the long view and set out on the path to more fundamental, relevant reforms, and an inspiring future. How? By investing in human capital and preparing people for the new opportunities of the fourth industrial revolution. The World Economic Forum has worked with leaders, experts and practitioners to create a common vision and a shared change agenda focused on how we learn, earn and care. 1. Transform education ecosystems. Most education systems are so far behind the mark on keeping up with the pace of change today and so disconnected from labour markets that nothing short of a fundamental overhaul will suffice in many economies. The eight key areas of action here are early childhood education, future-ready curricula, a professionalized teaching workforce, early exposure to the workplace, digital fluency, robust and respected technical and vocational education, openness to education innovation, and critically, a new deal on lifelong learning. 2. Facilitate the transition to a new world of work . While there are deeply polarized views about how technology will impact employment, there is agreement that we are in a period of transition. Policy needs to catch up and facilitate this transition. We propose four areas of action: recognition of all work models and agile implementation of new regulations, updated social protection, adult learning and continuous re-skilling, and proactive employment services. 3. Advance the care economy. Often undervalued and unregulated, care is one of the most fundamental needs among both young and old populations. It has a strong impact on education, and holds potential for job growth. We propose six areas of action: recognize and value care as a vital sector of the economy, professionalize the care workforce, rebalance paid and unpaid work responsibilities, expand high-quality care infrastructure, create new financial provisions to facilitate care, and use technology as a tool for balancing care and work. To do any of this – and to make it pay off – it is critical that policy design includes agile multistakeholder governance, empowerment of the individual, objective measurement, universal access and long-term planning as fundamental tenets. The rapid pace of change means we need to act urgently. By some estimates the current window of opportunity for action is three-to-five years. This may sound daunting but there are a large variety of robust success stories to learn from and emulate. There are also substantial new commercial opportunities – such as adult education, care services, employment services – that make this space ripe for public-private collaboration. It’s the harder path to follow, there’s no doubt about it. Transforming education ecosystems, creating a care economy and managing the transition to a new world of work require political will, innovative policy, new financing models and, most importantly, a new mindset. But this is also the only viable path if we want to get ahead of the transition underway and turn this moment of flux into an opportunity for revitalizing growth and realizing human potential in the age of the fourth industrial revolution. The whitepaper on Realizing Human Potential in the Fourth Industrial Revolution: An Agenda for Leaders to Shape the Future of Education, Gender and Work can be found here . Saadia Zahidi is Head of Education, Gender and Work and Member of the Executive Committee, World Economic Forum.